Last weekend’s two hour race on Silverstone’s Grand Prix circuit was the last GT racing hurrah (for now at least) for dsc favourites Wood-Scott Racing. After three seasons in the British GT Championship Stuart Scott and Steve Wood have chosen to leave the GT3 class and look elsewhere for their racing. 2003 saw the pair introduce their controversial, but popular, turbocharged VW Golf Gti: the 300bhp machine was seemingly at odds with the exotica on display, but attracted interest and no little affection amongst the crowds. 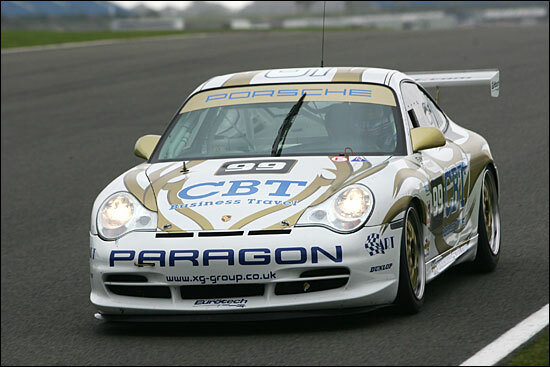 Last Sunday’s race saw the VW’s replacement, a Porsche 911 GT3 Cup, prepared by Mike Jordan’s Team Eurotech, run in Stuart and Steve’s hands for the last time - its 2005 blue and gold livery from the bulk of the season) replaced by white and gold for its last public appearance. Both liveries were lovingly applied by Steve’s ART outfit, the same company that applied the beautifully executed Audi UK / Veloqx purple and silver livery to the pair of 2004-season R8s. Sunday’s race was a mixture of incident, excitement and disappointment – as good a reflection of the boys’ British GT career as could have been squeezed into two hours of track action. Stuart took the opening stint, but just before the prior to the start time of one o’clock, a brief shower blew across the circuit. Race Control deemed the race to be starting “under adverse conditions.” With the Pace Car instantly becoming the Safety Car and the clock started as soon as wheels began to move. Thus, the first two race laps took seven minutes, before the Safety Car peeled off and the green flag flew. He did just that, aided in no small part by the immediate reappearance of the safety car, and hung on to the pack in difficult conditions, intermittent rain having started falling again. Up front there was a game of fast paced automotive chess, as the pendulum swung one way and then back, as the slick and intermediate shod cars found the conditions coming their way in turn. The rain soon began falling quite heavily, but with clearing skies away in the distance, there were some tough tyre choices to be made at the approaching stops. 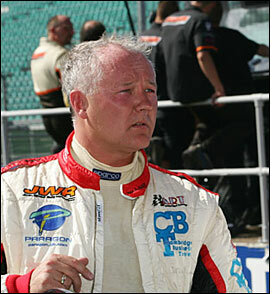 Eurotech chose to leave Steve Wood on slicks as he took over in #99, with other front runners choosing wets or inters. Allan Simonsen was another to stay on the treadless Dunlops in the UCB Ferrari. After a brief respite, the rain was soon falling hard again and within two laps was at its most intense. It seemed that those cars that had opted for wets would gain the upper hand. 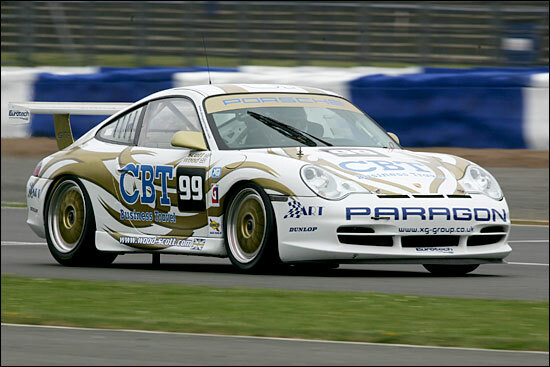 Steve though had been making great progress on slicks in the #99 Eurotech/Cambridge Business Travel Porsche. With less than an hour remaining, he was up to fifth and gaining on Jon Finnemore’s Mantis, a car which has been in the hunt for GT3 race wins throughout the season. The gap came down with every lap as Wood’s car responded to the conditions better than Finnemore’s. With 42 minutes remaining, Steve Wood took the place and now had a podium finish in sight. Further back, Simonsen had made his way up to sixth place (from a full lap down) and was catching the Mantis too. As the race approached its final quarter, it was shaping up to be a classic. The conditions seemed to change by the minute: tyre choice would have a key role in the final result here. 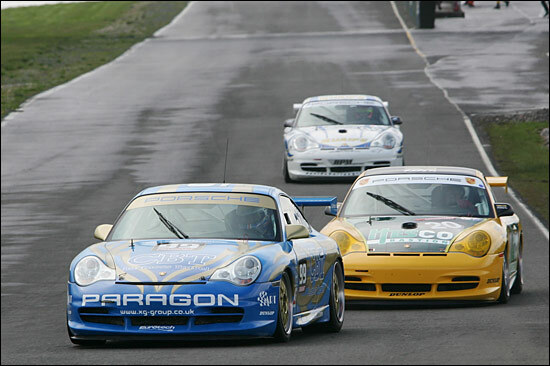 At the front it was a two-way Porsche battle – Piers Masarati attacking Chris Stockton with Aaron Scott’s Damax Ferrari holding third spot. 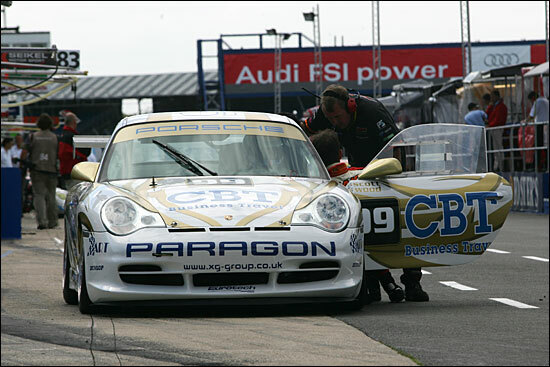 Whilst the 911 battle saw the lead change (Masarati taking it) as wets gained an advantage, there was much more to come on the drama front: the rapidly growing gap stalled as the rain stopped with 18 minutes remaining and then suddenly the Dunlop boot was on the other foot, the slick-shod Motorbase car reeled in the Tech 9 machine and with nine minutes to go retook the lead. But if the fight for the lead was dramatic, it had nothing on the tussle for the remaining podium position. Steve Wood was having a storming afternoon and was another to find his slicks coming into their own in the final fifteen minutes. 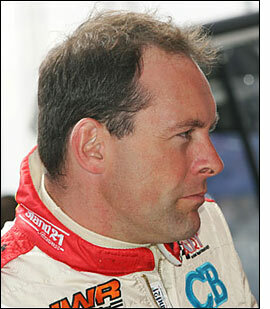 Aaron Scott was ahead in the wets-shod Damax, but the Eurotech driver was now much faster. 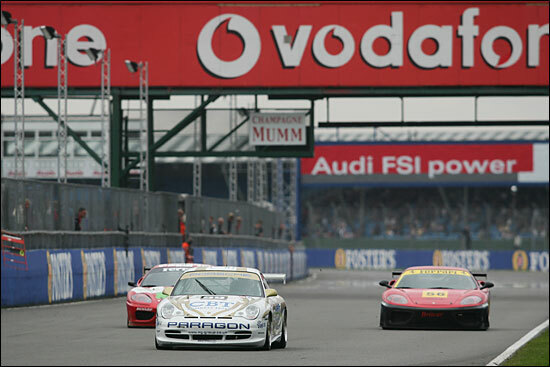 As the Ferrari struggled, Wood pressed home his attack, and was through into third at the start of the penultimate lap. Unfortunately for him, he now had Simonsen behind him (below, the Ferrari with a hint of green visible on the bonnet) and the Dane was just extraordinary. From a lap down, he had fought his way back in inspired style. His speed was astonishing towards the end – at one point (and on a drying track), he was the fastest man in the entire BGT field (GT2 cars included), by a good two seconds – and was just one second behind Wood with two laps to go. Steve watched his podium place hopes disappear before the lap was over (or did he?). 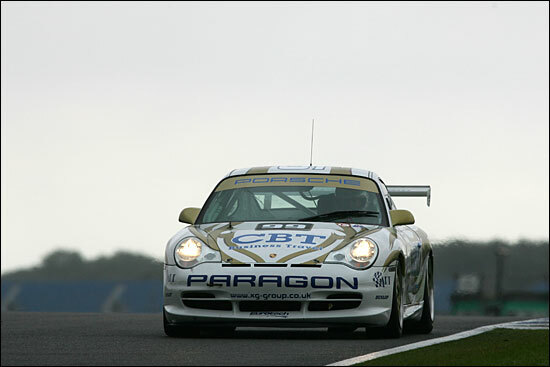 Simonsen started the last lap 13 seconds behind the Tech 9 Porsche, with Steve right behind. Surely not even the Dane could make that up over the course of one lap? Masarati’s wets though were now completely gone and by the time the cars entered Priory, Simonsen had caught up and was all over the Porsche. It still seemed as though Masarati would hang on to second; but Simonsen saw a gap as the cars came through Woodcote - and he lunged. The cars were absolutely side-by-side as they roared past the flag - and all eyes turned to the timing screens .They took a couple of seconds to update – in the drama of the moment, it seemed to take an age – and then the result was revealed……..Simonsen by one thousandth of a second! All those watching knew that they had seen something special and the man himself was aware of the magnitude of his achievement that day; “That was one of my best drives ever,” was the Dane’s conclusion. Slightly, only ever so slightly, overshadowed by this piece of magic was Steve Wood’s gallant effort. His last lap was 2:02.511, while Simonsen’s was 2:02.503, and he missed a podium by just four tenths of a second. Steve was looking for an opportunity to get by Masarati too, but the finish line came just a tick or two too soon. Wood and Scott had left their best until last and departed the BGT with mixed emotions. Stuart Scott: “I knew that when the rain came Steve would make up places; he absolutely loves racing in the wet. "I thought we’d get the podium, but Simonsen was just too fast at the end. ”It’s a sad day of course. With the Porsche now up for sale, the Golf being overhauled and Stuart looking wistfully at Ford Galaxies (that’s the 1960s 7 litre muscle car and not the 1990s 7 seater MPV!) 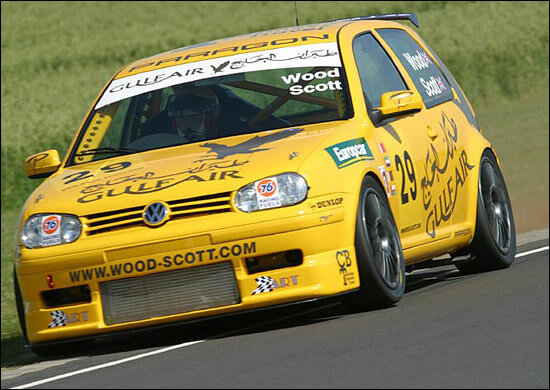 with a view to some classic saloon outings, it’s the end of an era for Wood-Scott Racing – but the funny thing is though, you can’t help feeling that they’ll be back. Let’s hope so.